Businesses are changing rapidly, thus, organizations require flexible and adaptive business applications to respond to these changes rapidly and effectively. Business rules provide an elegant solution that enables businesses to manage dynamic business logic by separating business knowledge from its implementation logic. The drawback of most business rule approaches is the lack of their standardization and interoperability. Also the lack of service-orientation makes it hard to access the knowledge within and across enterprise computing environments. In this project, a service-oriented business rules engine based on RuleML, is designed and implemented. ViDRE enables enterprise applications to access business rules as easily as accessing a database, by exposing rules as Web services. ViDRE uses RuleML as an interlingua to represent facts, rules, and queries. One of the main contributions of the ViDRE approach is the ability to distribute rules and facts across various rule engines, therefore, enabling powerful ways of separating and executing business rules within intra- and interorganizational boundaries. A Java Webstart version of the ViDRE Admin Client is available here (10.5 MB, with all libraries included). This server is currently down, if you want to have a source drop of ViDRE please send a mail to: florian AT vitalab dot tuwien dot ac dot at. 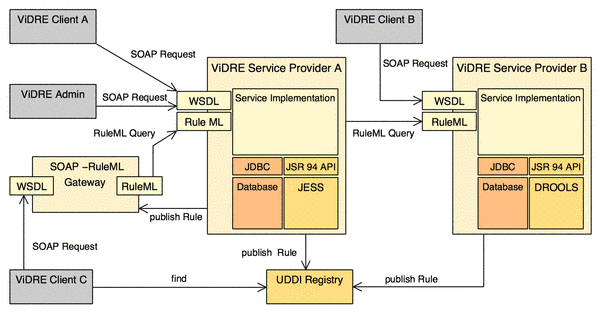 Nagl C., Rosenberg F., Dustdar S.: ViDRE - A Distributed Service-Oriented Business Rule Engine based on RuleML. Proceedings of the The 10th IEEE International Enterprise Distributed Object Computing Conference (EDOC'06), 16. - 20. October 2006, Hong Kong, China. (to appear). October 2006. Rosenberg F., Dustdar S.: Towards a Distributed Service-Oriented Business Rules System. IEEE European Conference on Web services (ECOWS), 14-16 November 2005, IEEE Computer Society Press. November 2005. Rosenberg F., Dustdar S.: Business Rules Integration in BPEL - A Service-Oriented Approach. 7th International IEEE Conference on E-Commerce Technology (CEC 2005), Munich, Germany. July 2005. Rosenberg F., Dustdar S.: Design and Implementation of a Service-oriented Business Rule Broker. 1st IEEE International Workshop on Service-oriented Solutions for Cooperative Organizations (SoS4CO '05), co-located with the 7th International IEEE Conference on E-Commerce Technology (CEC 2005), Munich, Germany. July 2005.